The 2018/2019 Catalog is online! Memorial Stones can be a tribute to a loved one or a way of showing your sympathy for a friend in their time of loss. 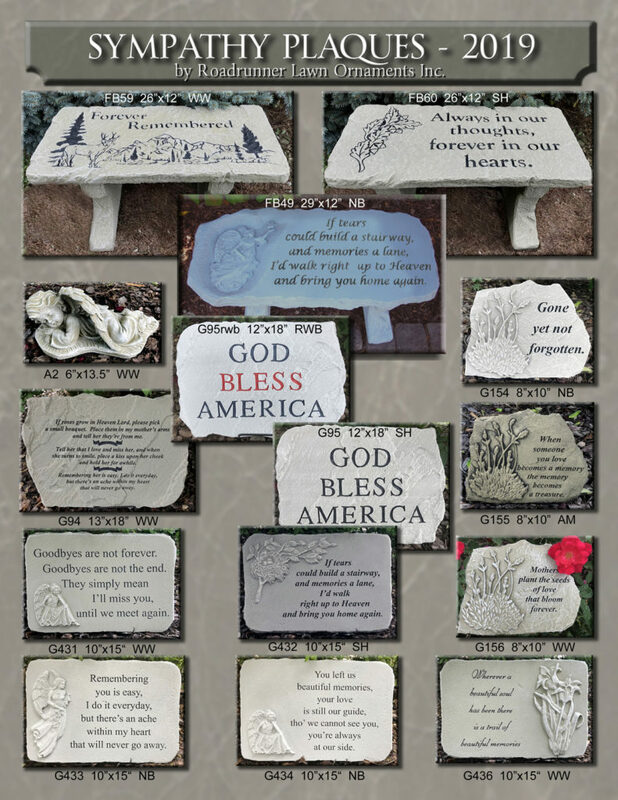 If you are looking for memorial stones, plaques, or benches to express sympathy in a way that will be a lasting memorial, we have the products for you. If you have questions you can reach our sales representative, Mark, toll free at 1-800-888-0524. You can navigate our site using the menu bar above. Wholesale programs are available for all sizes of stores. Please see the Wholesale Page for more information. Some wholesale content is restricted and may only be accessed by registered dealers. All of our products are made in the USA of cast stone and are finished by hand to create a product that will last for years to come. We are a family owned business that has been making quality ornamental products and memorial items since 1983. You can find out more about our company on the About Us page. We have a variety of Memorial Stones, Memorial Plaques, Benches, and Angels. We look forward to serving you, please contact us with any questions. Sympathyplaques.com is a division of Roadrunner Lawn Ornaments Inc.